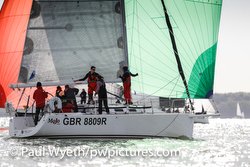 J/News Articles: Hamble Winter Series- Sunny, Wet First Weekend! 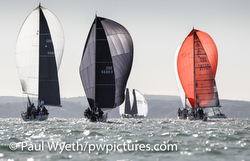 (Hamble, England)- The IRC Autumn Championship took place over the weekend of the 6th & 7th October and, as anyone who was in the Solent last weekend will tell you, these were two very different days. Hamble River SC PRO Kathy Smalley summed it up when she said "It was a game of two halves!" If you prefer musical references to sporting ones then "Wet Wet Wet" summed up the overture to the weekend. Day One- Wet & Cold & Miserable! On the Saturday, Kathy, assisted by her redoubtable linesman, Peter Bateson, took up station at 4W (Goodall Roofing) and waited for the fleet to show up. Despite the rain and the building northerly, show up they did. Some 32 teams made the start area. The course consisted of a cascading windward/leeward with a windward mark 8R and Solent fixed marks. In IRC Class 2, the first race saw an epic battle between the two J/109s- Roger Phillips’ DESIGNSTAR 2 and David Richards’ JUMPING JELLYFISH. In the first race they finished 3/4 and in the second race 1/3 with the JELLYFISH holding the advantage. In classes 3 & 4 only two boats in each class braved the Saturday conditions. Joe Banks’s J/92 NIGHTJAR had two bullets in Class 3. With the conditions worsening in line with the forecast, the race team displayed AP over A and sent everyone home for the day. There was a suggestion that a lack of gas, and therefore hot drinks on the committee boat had something to do with the decision, but this has been dismissed as Fake News! Day Two- Gorgeous, Sunny, Lovely! Sunday dawned with beautiful conditions and 10 knots of breeze from the North. Once again, the committee boat set up at 4W. There was plenty of tacking and gybing in evidence on the beats and runs indicating some well set windward/leeward cascades on the west going tide. The improved weather brought some 52 boats out to play. The big battles for the top places were in IRC Class 2. Three boats ended tied on 14 points in Class 2 and countback gave the win to the J/109 JUMPING JELLYFISH and third went to the J/109 DESIGNSTAR 2. Taking the Autumn Champs win in IRC Class 3 was Banks’ J/92 NIGHTJAR! The Bugle presented the Sunday day prizes in a packed HRSC. Next week the HYS Hamble Winter Series continues along with the Hamble Big Boat Championship and the Hamble One Design Championship. 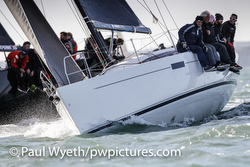 The 2018 HYS Hamble Winter Series will run from the 6th October to 2nd December 2018. Teams will be racing in IRC Classes and One Designs. The action pack program will feature the IRC Autumn Championship, the Performance 40 Series, the Hamble Big Boat Championship, the Hamble One Design Championship, and 2019 J/70 World Championship Qualifiers that will be sailed in Torquay, U.K. in the “west country”. Sailing photo credits- Paul Wyeth Follow the HYS Hamble Winter Series on Facebook here For HYS Hamble Winter Series sailing information Add to Flipboard Magazine.